Over the last 18 months we have been told intermittently that we need more art on our walls. This is normally followed through with the production of a contact card with website details which I accept graciously whilst telling the producer of said card that we have a few projects in mind and anticipate adding to the points of interest around the dining room and lounge area in due course. We were quietly confident that we would soon be filling another space on the wall following a recent visit which ended with the flourish of a piece of paper informing us we had been judged. The delightful couple who had braved the awful weather conditions on a dark and stormy evening had thoroughly enjoyed their evening of quality local produce. Whilst this may sound rather blasé, the truth is we were absolutely thrilled! 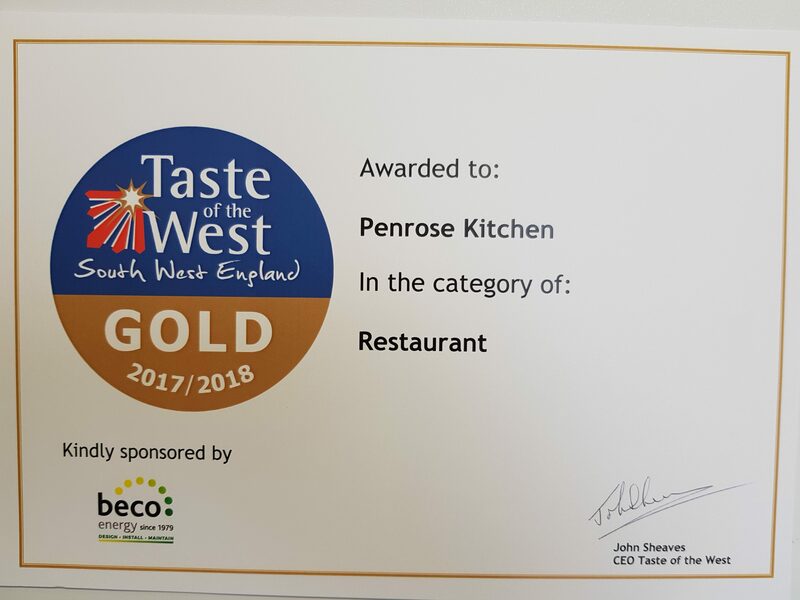 To receive a gold award last year within 6 months of opening was a real milestone for us and our business but what makes this even more special is that we had upgraded from the Casual Dining category to the Restaurant category. For us this really defines the business since the relaunch in February and we hope that this reaffirms our commitment to sourcing and using the best that Cornwall has to offer. 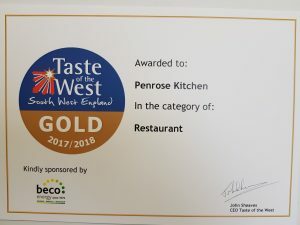 Cornwall is really being put on the foodie’s destination map and we hope that Penrose Kitchen will be too. We have great working relationships with our suppliers and will be doing a lot of site trips over the next few months which we will be sharing via our blog page. This is our artwork that we will be displaying on our plain walls. To us this is priceless but not without cost, not in monetary terms and as far as we’re concerned worth it. Now I’m off to find a hammer and a nail!